Surveying: High resolution topographic mapping can be easily captured with the scanner. The standard maps may not be accurate enough at small scales, so scanning the local terrain is the only solution. BIM: This buzzword has been around for a while and what is it? Building Information Modeling is making everything about the building construction phase useful and meaningful. Every step in the design process has important information about the construction. That's why you need to accurately document it using laser scanning. Historic Preservation: Create an accurate digital model of the site and buildings or monuments of value. This allows you to explore and preserve the artifacts for study at a later date. Also it allows documentation of complicated and hard to access sites and buildings. Industrial facilities: Just try to measure a working shop or factory floor with anything else. Laser scanning is a fast and efficient method to capture as-built conditions and is cost effective. 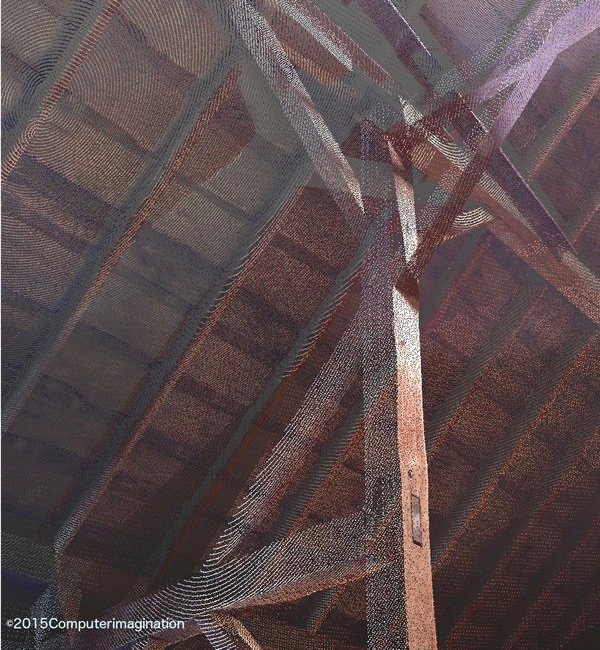 This is an actual scan of a barn interior structure. It is 3D so all sides are included so viewing it from any angle is possible. Also acurate dimensions can be taken from it for reference and import to CAD. We are excited to offer 3D Laser Scanning! We are the newest company in the state to offer 3D Laser Scanning services. The point cloud file can be used for archives, existing conditions, as built drawings, very accurate dimensions, historical preservation, engineering, B.I.M. architecture, and commercial construction applications. 3D scanning is the best way because of its speed and accuracy and ability to go where no tape measure has gone before. This is a major step in new technology measuring. Contact us today!